For Sarah Kunst, where a Tinder romance ends, a business relationship has often blossomed. The 29-year-old venture partner spends her time flying back and forth between New York and San Francisco. She's too busy for bar hopping. Now, she does a quick tap or a swipe to get dates. But unlike other women who run in the opposite direction when they feel no spark, Kunst keeps in touch with some of these men over LinkedIn (LNKD). One of them even introduced her to people at multiple companies when she was in the midst of job searching. "If I kissed a guy once on a date and two years later, he's doing something great and I want to invest in it or I want to partner with him, I won't hesitate," Kunst told CNNMoney. Kunst says most young people today are okay with mixing business and pleasure. "It's probably a very millennial thing to not feel awkward. In the startup world, people are starting companies with people in dorm rooms while sharing a bunk bed," Kunst tsaid. "A lot of barriers have fallen in terms of awkwardness." Not everyone may be as confident treading the fine line between dating and business. 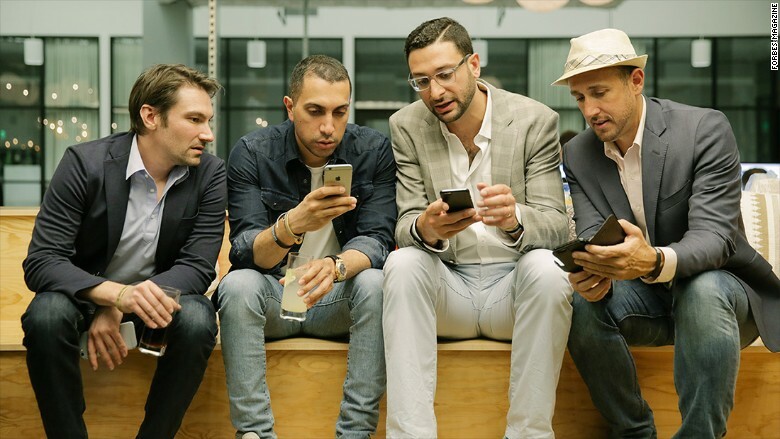 For them, Tinder co-founders have designed a strictly professional networking app. The app, built in-house by Forbes, is exclusive to the 2,000 budding entrepreneurs who've been featured in the Forbes Under 30 lists so far. They will be able to network with each other during and after the second annual Forbes Under 30 Summit in Philadelphia between October 4th and 7th, where the app will officially launch. 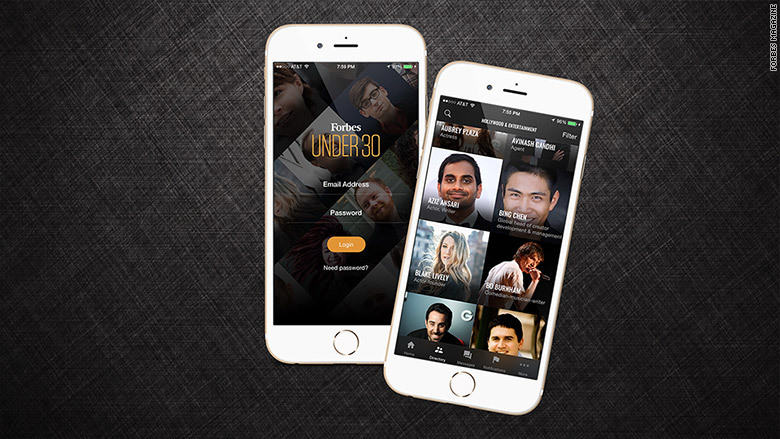 The Forbes app will feature directories, messaging, and networking opportunities for the Under 30 community. Users will be able to swipe through photos, Tinder-style, with the aim of networking -- not finding romance. The founders of Tinder were themselves on the 2014 Under 30 list. Tinder did not respond to CNNMoney's request for comment. Forbes had a launch party for the 'Under 30' app in San Francisco on Wednesday. Sean Rad and Jonathan Badeen of Tinder were present. "The under 30 community is about successful influential millennials in America," said Salah Zalatimo, Head of Mobile Products at Forbes. "They all do great things. If we can connect four of them, they can do even greater things together." Kunst was featured in the 2015 Forbes Under 30 list. On Wednesday, she tested the app at a small launch party in San Francisco. She says its a great resource to interact with people within and beyond your own industry. Is speed networking the new speed dating? Then why not open it up to all entrepreneurs, not just the ones who made Forbes' cut? "Our goal was to focus on quality over quantity," Zalatimo said. "We wanted to build a platform for a niche, passionate community to interact." Also, by keeping access limited, the people are somewhat vetted and less trolls are likely to surface. If you're not on the list, there are more LinkedIn-meets-Tinder apps in the market, including Weave, Treatings and Networkr. Hey, if there can be a Tinder for pot smokers, there can be a Tinder for anything, right?